Not far from Morcambe Bay in the grounds of the old manor house a new property has been built . Unlike the old premises the new house centres around an open plan living space. The kitchen complete with mezzanine has large expanses of glass looking out onto newly landscaped gardens. At the heart of the house light floods into the kitchen, it is an impressive and sociable space fit for modern family life. All within site of the old manor but a million miles away in design terms. Careful thought has been put into the garden design too. As you would expect local stone has been put to good use to provide attractive walls for both privacy and for the plants to grow against. A modern greenhouse has been fitted, conveniently located close to the house for ease of access. 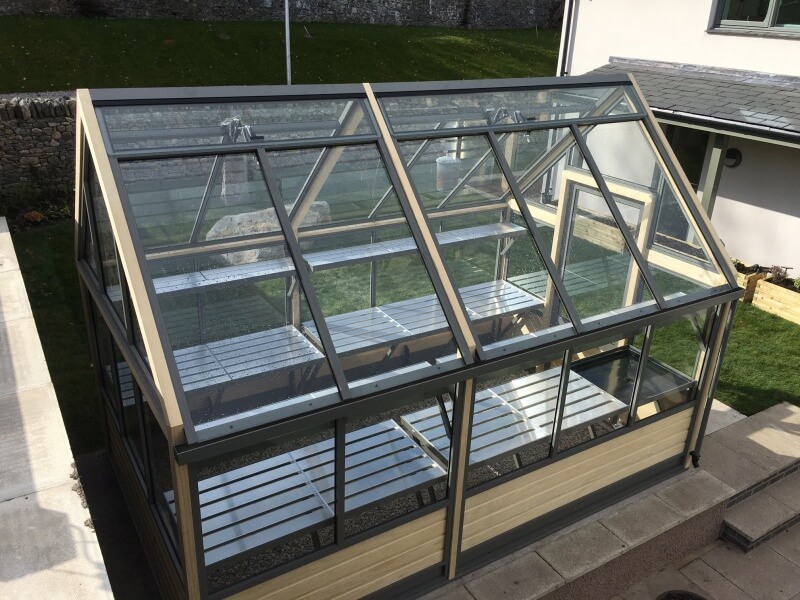 Like the kitchen the greenhouse is light and airy due in the main to the full length frameless roof vents combined with the generous 45 degree roof pitch. Low level Accoya boarding adds an element of permanency and has the advantage of hiding from view any bags of compost and old pots that might be stored away under the staging. The greenhouse glazing matches the home, slim aluminium sections free from any unsightly fixings cushion the glass in place with modern EDPM gasketry. The colour too is in keeping with the house and works beautifully with the surrounding masonry. 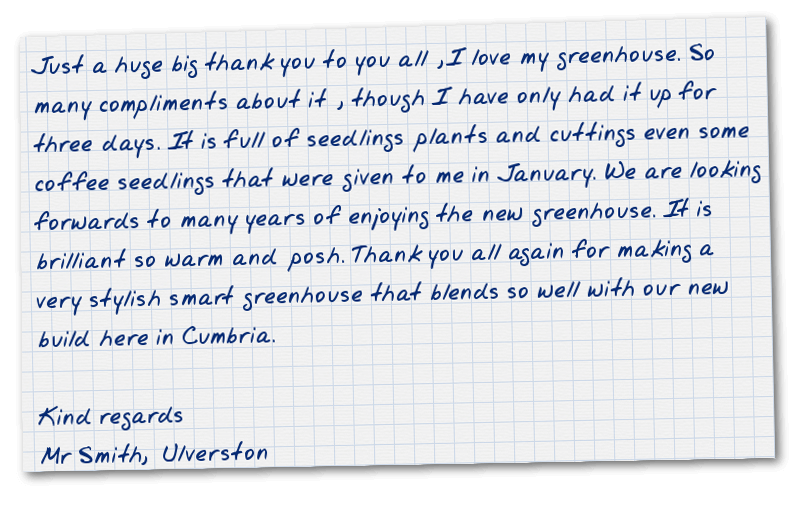 The Greenhouse is the engine room for the garden, integral to the design. Gardening starts early if you have a greenhouse. You can steal a march on Spring and get your seeds and plants going under the protection of glass. 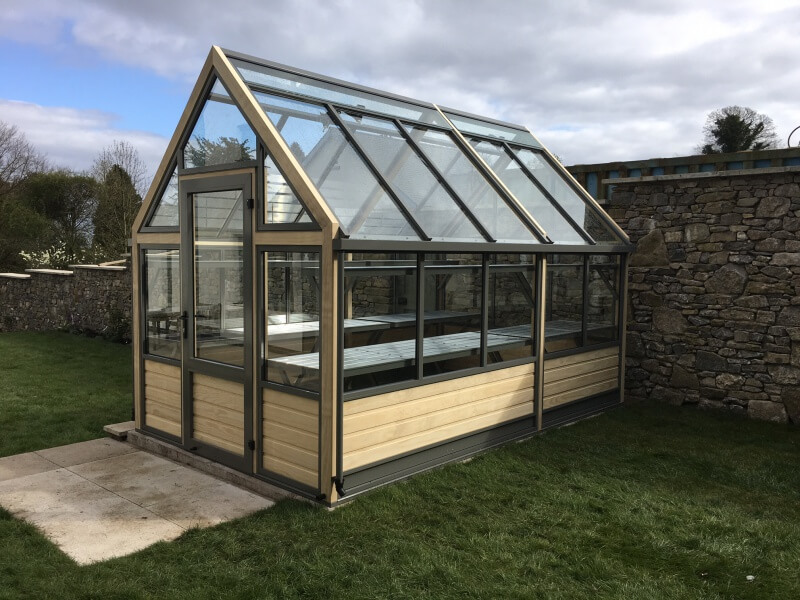 A greenhouse doesn’t just extend the garden calendar, you’ll find much more opportunity to garden, on a wet day or during cooler evenings for instance. The greenhouse base consists of a simple concrete footing with a flagstone path down the middle. 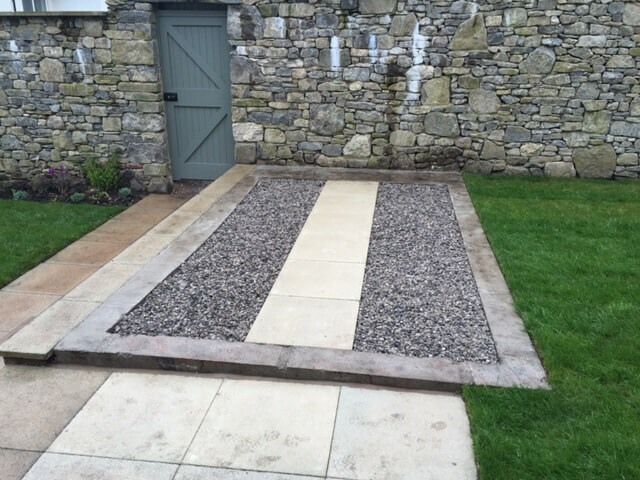 Gravel beds to each side allow any excess water from watering to drain away freely. A well laid base by Leck Construction provides a solid foundation for the greenhouse. The old walled garden has been retained, full of mature plants with easy access from the new house. This is a charming garden, a bridge between contemporary and old.